One of my tech fellow goals was to use technology to better facilitate the multiple learning styles of students taking my Advanced Data Analysis class. Research statistics can engender a good deal of anxiety for students. Math anxieties are common, and can lead to patterns of procrastination and avoidance when learning research design and statistics. As a psychologist, part of my teaching process includes finding ways to “demystify” complex processes and to address students’ level of anxiety at each step of the learning process. By breaking learning into small pieces, using repetition across a variety of learning methods, and assigning lots of weekly homework assignments, the course provides many “graded exposure” experiences, where students can, over time, master their anxiety of statistics and (at least for some!) start to take pleasure in the process. For the current project, I wanted to try to incorporate brief SPSS tutorials into my Moodle shell, using both Atomic Learning (24/7 Technology Training) modules and some of my own brief tutorials developed using Panopto with direct screen capture of me conducting (and narrating) specific SPSS analyses. This technology would allow students, whose anxiety can interfere with memory consolidation during class, to go back to review how to implement basic SPSS procedures and analyses on their own time. In addition to my own lectures that incorporate conceptual discussion and marked-up static screen captures of SPSS outcomes, I thought that these tutorials would be a helpful addition for students who have difficulty following (or remembering) how analyses were conducted during classes. As part of my planning process, I conducted a brief survey of students at the outset of my spring Advanced Data Analysis course. Survey questions included information about the students’ previous training in both research design and statistics, and their feelings about these previous courses. 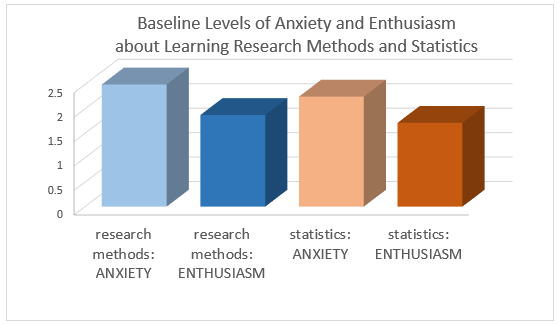 These data suggested that, in general, they had found their previous learning to be on a “pretty superficial level” and their previous experience of learning to be, on average, “tolerable, but not terribly interesting.” When asked to rate their current level of anxiety and enthusiasm about learning about research design and statistics, they generally rated themselves as more anxious than enthused. In addition, I queried the students regarding their preferred methods of learning when it comes to research methods and statistics (see below). On average, the group showed a preference for working through problems as part of a larger group discussion and feedback session, with the lowest ratings for straight lectures about research concepts. 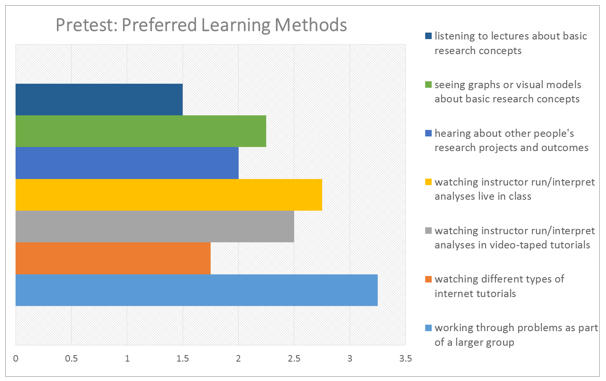 They also expressed a mild preference for watching the instructor run/interpret analyses live in class (as opposed to watching videos of the instructor), and both of these methods were preferred above watching other internet tutorials. When discussed in class, students clarified that they would find brief instructor-led video tutorials to be helpful, but only as an addition to live classroom demonstrations, rather than in place of live sessions. I have started implementation this semester. At the beginning of the semester, a number of brief Atomic Learning tutorials were posted to Moodle, most with the goal of aiding those students with little to no previous SPSS experience to become familiar with basic data manipulation and cleaning procedures. In addition, I have played with developing my own tutorials in Panopto, posting the first one on how to run moderation analyses in SPSS. More of these videos will be posted in the next section of the class covering ANOVA analyses, with formal assessments from students to be conducted at the end of the class. Despite the “mean level” preferences reported in the above graph regarding student learning preferences, I was struck by the stark differences reported by different students with respect to their preferred modes of learning. This makes me think that continuing to incorporate multiple media approaches to learning will be the way to go, in order to enhance learning experiences across a range of different learners. It will also be interesting to see if the students’ preferred learning strategies and/or levels of anxiety or enthusiasm for the material changes at all following completion of the class. Formal assessments from students will be collected at the end of this spring term class. Informally, I’ve found that that not all of the Atomic Learning videos are great, so it does take some time to find the tutorials that will be most helpful for student learning. I’ve also learned the importance of maintaining consistency when selecting and/or developing on-line tutorials of basic procedures that we cover in class. While you can often find a number of ways to run the same basic procedures in SPSS, early learners of the software get confused if you introduce too many options too early in the learning process. I’ve also learned that it is unlikely that I will do away with running most all analyses together in class (in a format where students can ask questions and talk through the process, and in which we can interpret outputs together as a group). Indeed, when I floated the idea of only posting some taped tutorials (which do supplement both book procedures and my lecture slides), there was mild panic from the class. This semester, I will work to develop a few more basic tutorials based on the basic ANOVA analyses we will be running in class. I also plan to go through additional Atomic Learning modules covering basic Regression and ANOVA procedures. I will retest the group at the end of the course, and will use those data to inform further modifications to the class for next year.